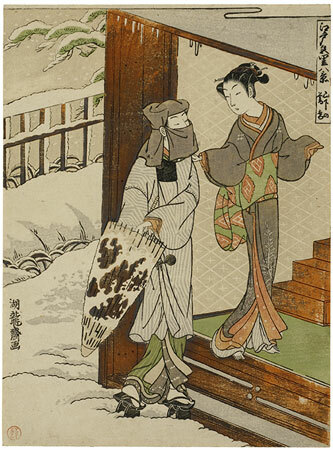 From “Eight Views of Licensed Quarters in Edo” A client is seeking to be admitted incognito to a brothel and is received by a shinzō. The print is a good example of Koryusai’s early style and one of the works most influenced by Harunobu. Characteristic of Koryūsai’s work is the use of tan orange for wooden elements, for which Harunobu usually used pink. The grey shadows on the left are an early example of the shadowing technique itabokashi (the “bevelled printing block”). Sometime after the death of Harunobu, in the early 1770s, colour printing became commercial. The large, heavy paper of the late 1760s which lent itself so well to the effects of embossing and elaborate printing that we associate with Harunobu was replaced by a thinner material, and the range of colours which seemed limitless in the experimental enthusiasm of the 1760s were restricted very much to the range used so effectively in this print: blue, purple, red, orange, apple green, pearl grey. The artists most involved with this development were the actor portraitists of the Katsukawa School and Koryūsai. Perhaps because of the limitations imposed on the medium of the woodcut in the 1770s, Koryūsai’s designs are often weak and unimaginative. Perhaps it was his dissatisfaction with the new conventions that led him to turn to bird-and-flower prints which in their size and technique revived the glories of the Meiwa period. In the end however, he gave up print design altogether and confined himself to painting. The present print of a client visiting a brothel in an outlying area of Edo is a very fine example of Koryūsai’s early style. On the snowy bank at the left the blurred edge of the grey shadow is an early use of the bevelled block, or itabokashi.